When I joined the team I have been working with recently, they were trying to create a graph using Core Plot, a popular third party library. It didn’t go well though, there were two big problems. First, they couldn’t use a custom image for the graph’s background, as was required by the designer. Second, the quality of scrolling was unacceptable. By that time, I already had a couple of graphs under my belt, so I suggested an alternative approach: to draw the graph from scratch using nothing else but Quartz 2D – a graphics rendering API created by Apple, a part of the Core Graphics. At first, this solution didn’t seem optimal. After all, many third party libraries were created to shield developers from using low level APIs, to save our time and effort. However, working with Quartz 2D isn’t that hard. You just need to know how to do certain things, and once you’ve learnt them, you can move forward quite quickly. I spent just a couple of weeks creating a sophisticated solution that implemented every little wish of the designer. In this series of articles, I am going to share with you the approach I am using for drawing graphs. Let’s put together some requirements for our future solution. It should scroll smoothly, and easily resize for different datasets. It should respond to touch by displaying an appropriate information. It should look well and be flexible enough to make our designers happy. We need to create an Xcode project that will host our gradually emerging graph. The View-based Application template will work just fine, and you can give the project any name you find appropriate. I named it MyGraph. After the template project is generated and saved to a location of your choice, our first task is to create a simple user interface. Let’s create a graph that occupies the whole view in landscape orientation, but only the upper part of the view in portrait orientation. We can decide later to use the lower part of the portrait view for some controls, or for displaying our data as a table. The important requirement is that the graph should scroll in whatever the amount of space is given to it. 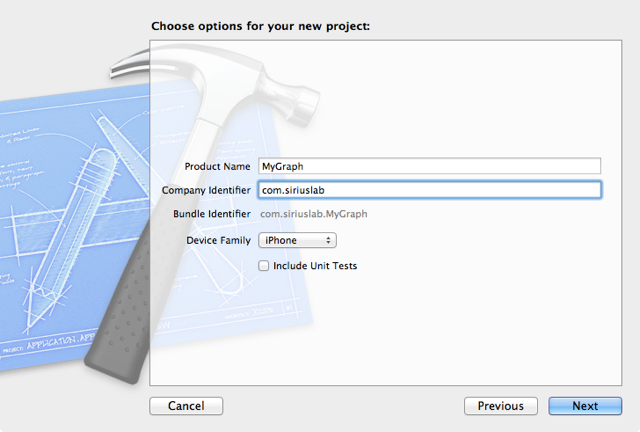 In Xcode, select the MyGraphViewController.xib file. In the Library, find the Scroll View and drag and drop an instance of it to the main view. With any luck it should snap into place, see the below image to check your progress. 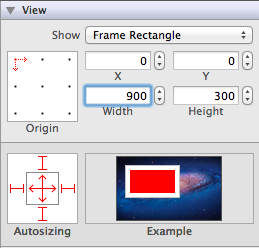 For drawing, we are going to use a simple view or, to be precise, a subclass of UIView class. 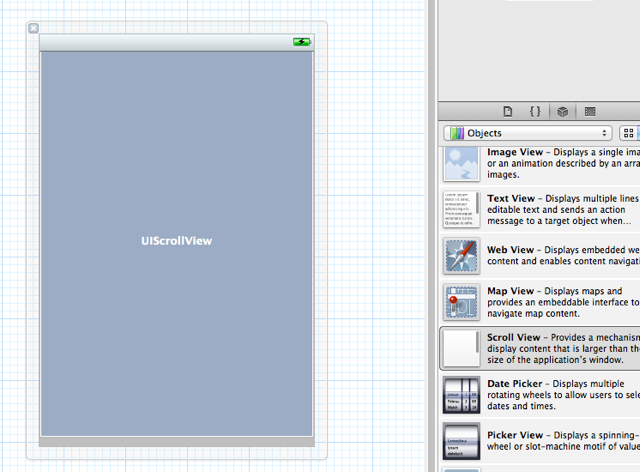 In the Library, find View, then drag and drop one right on top of the UIScrollView. 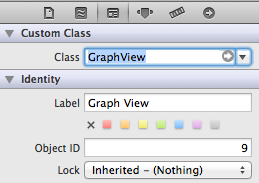 Expand the hierarchy of the objects in the MyGraphViewController.xib file and make sure that the newly added view became a child of the Scroll View. Also notice that I’ve labeled the two views Main View and Graph View appropriately. This is very easy to do – just press Enter with the view is selected in the hierarchy and give it a new name – but can become incredibly convenient as the number of views in the graph grows. We’ll want our Graph View to be wide enough, so that it could scroll in the Scroll View, so let’s give it an initial width of 900 pixels, as seen in the image below. This brings the initial setup to completion, and we can start drawing. We’ll want to start from something simple, something that will just confirm to us that everything is right. A straight line is about the simplest thing one can draw, and most graphs have some sort of grid lines as a visual aid. It would be reasonable then, to start from drawing a bunch of grid lines. But where exactly we are going to draw? 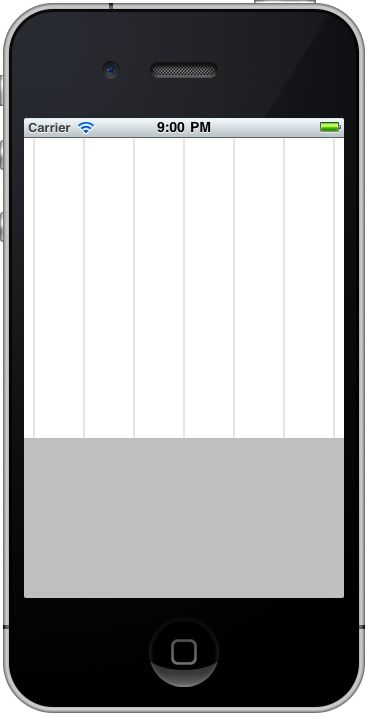 So far, our Graph View is just a stock UIView that draws nothing. What we need is to extend the UIView, and in the new class override the drawRect method: that’s where our drawing code will go. First, we define two constants for the width and the height of the graph, they correspond to the dimensions of the Graph View in the XIB file. We’ll be changing the width of the graph dynamically, but it’s good to have a default value. As for kStepX and kOffsetX, they define the horizontal distance between the vertical grid lines and the offset for the first line respectively. Preparation. This is where we define which resources and dimensions we are going to use: colors, fonts, dimensions and so on. Actual drawing: our code draws lines, curves etc. Commit. We need to tell Quartz 2D that we’ve done with this step of drawing and it can make our art visible. If we omit this step, nothing will appear in the view. Further on, I won’t show the complete code anymore as it will be getting longer and longer. Basically, whatever we’ll be adding after this, will always go to the bottom of the method, unless specified otherwise. If you want to see the completed version, you are welcome to checkout the Github BuildMobile Quartz 2D Graph repository. Run the application, and you should see the vertical gray lines in the graph view. However, when we turn the device to the landscape orientation, the graph doesn’t follow the rotation. We should explicitly declare that we do support change of orientation. 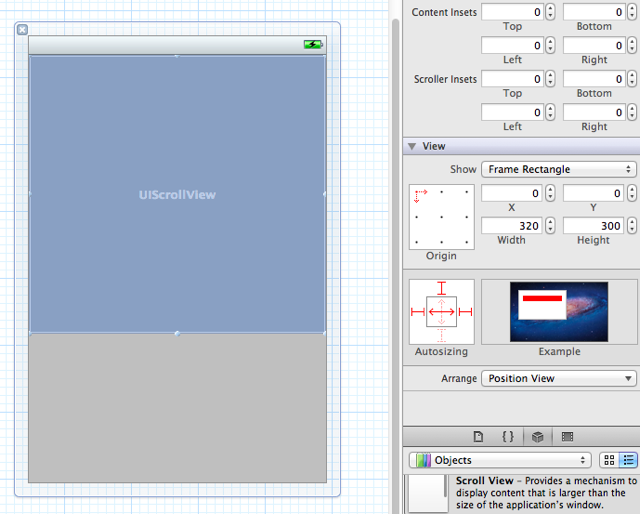 In MyGraphViewController.m, change the shouldAutorotateToInterfaceOrientation method so that it looked like this. Try to run the app again, and this time the future graph will follow the rotation of the device. Unfortunately, the graph doesn’t scroll yet. That’s because we need to explicitly tell the UIScrollView what’s the size of its content. And to be able to do that, we need to have a pointer to the UIScrollView. Release the mouse button, give the new outlet a name, say, scroller, and Xcode will automatically write all the code required to properly obtain a pointer to the Scroll View and maintain it. 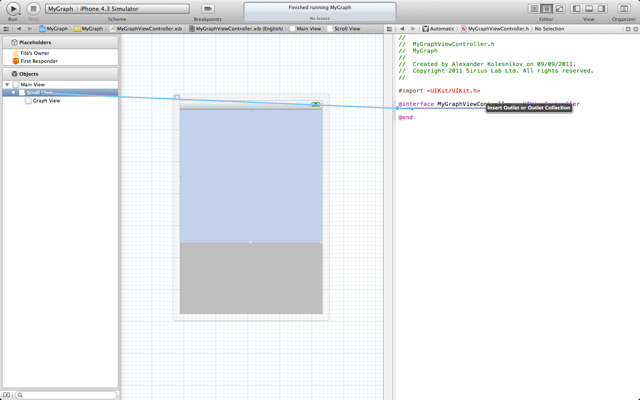 Here is what the resulting code should look like in MyGraphViewController.h. A few lines of code will be added to MyGraphViewController.m as well. 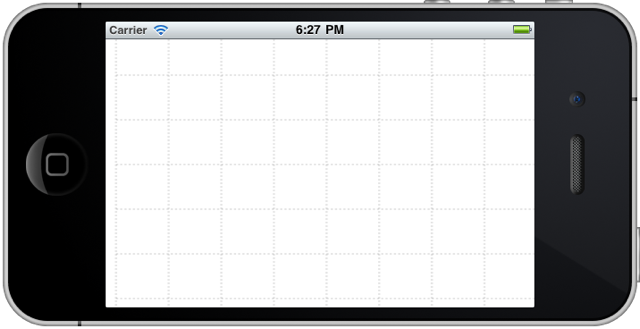 Now you can run the app, and the Graph View will scroll nicely, in both portrait and landscape orientation. To be honest with you, I decided to draw the grid lines before enabling scrolling so that you could easily notice whether or not the graph needed to be scrolled. Now that the grid lines are there, we might want to tweak them a little bit. Then add the following lines of code right after drawing the vertical grid lines, before the line that commits the drawing. If you run the application, you will see both the vertical and the horizontal grid lines. In many cases, this kind of grid line will be good enough, but your designers might not be happy until you make the lines dashed. Thankfully, we can do that easily by simply adding a couple of lines of code to the preparation step. Right underneath the line that sets the stroke color, add the following code. The dash array specifies that there are two elements in the pattern: a dash and an empty space after it. The last parameter of the CGContextSetLineDash function, 2, is the number of elements in the dash array. Knowing this, you can experiment with different types of dash patterns to create something that is appropriate for your purposes. If you run this code as it is, you should see the grid lines in the following screenshot. Any other lines that we are going to draw later won’t be dashed, so we need to disable the dash that we’ve set up before. To do that, insert the following line of code right after the line that commits the drawing. Now we’ve prepared everything we might need before actually drawing the graph. The only other enhancement we might want to add is a graphical background for the graph, possibly crafted by our designers. I am not a designer, so the background I’ve created is very simple. The file is named background.png, and you will find it in the code on GitHub. Alternatively, you can create a graphic of your own, it should be 300 pixels tall and 900 pixels wide. Admittedly, using both a graphical background and grid lines in this particular case looks like an overkill. You might decide to leave either the background or the grid lines, but at least you know how to draw both. Note: In this particular case, the background is very simple. If it was a more complex drawing, you would notice that it’s being drawn upside down. We’ll learn how to deal with this later in the article, for now let’s just leave it as it is. Now that all the background work is completed, we can start drawing the actual graph, and this is exactly what we shall do in the next part of the article. Grab the Quartz 2D Graph code from the GitHub Repo and leave us your thoughts and questions in the comments. See you soon.